On the 17th November 2015 Ex-MilitaryCareers.com were invited to Buckingham palace for a reception hosted by Queen Elizabeth II, Prince Henry of Wales & Prince William, Duke of Cambridge to thank us for our support and welfare to those who have served our country. We are regularly invited to attend the governments "round table" veteran discussions at the house of commons. Providing insight into veteran employment sustainability. Ex-MilitaryCareers.com are proud to be Broadgate Search's APSCo Corporate Social Responsibility initiative finalist partner. 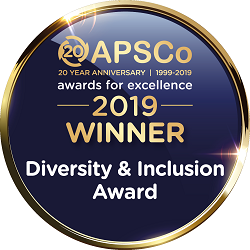 For the APSCo recruitment member or affiliate member that has implemented the most effective Corporate Social Responsibility initiative, consistent with the professional values and exceptional performance associated with APSCo membership, throughout the past 12 months.